Garage door openers have been around for a long time, which means there aren’t’ a lot of unknowns in how they function. They last a long time and they are surprisingly reliable more or less across the board. Today’s models come with a wide range of features that deserve a close look. If you’re in the market for a new opener this year, these are some of the top garage door openers. The LiftMaster Premium Series 8355 makes the list for being the best belt drive garage door opener. This product features a 1/2 HP Belt Drive Motor that offers quiet operation and minimal vibration thanks to its Motor Vibration Isolation System. The LiftMaster Premium Series 8355 is also energy-efficient and comes with MyQ Technology and Security+ 2.0, as well as additional security and safety features. The LiftMaster 8165 is considered the best chain drive garage door opener of 2016 due to its dependable 1/2 HP motor and industrial-strength chain drive. These components offer durability and a smooth, quiet performance. The LiftMaster 8165 also reduces power use by up to 75 percent when it’s in standby mode, adding to its affordability for homeowners. This product also includes MyQ technology and Security+ 2.0 for safety and security. The LiftMaster Premium Series 3240 is considered the best direct or screw drive garage door opener based on its 1/2 HP motor and industrial-strength screw drive, which offers reliable performance. Its Motor Vibration Isolation System provides quiet operation, while Security+ helps prevent intruders. The LiftMaster Premium Series 3240 is able to operate in different climates, even during heat waves and cold snaps, thanks to its efficient no maintenance screw rail design. This belt drive DIY garage door opener, which is sold at Home Depot, is designed for garages that are attached to homes. The Genie SilentMax 750 features a lightweight 3/4 HP motor that offers easy installation. The steel reinforced belt drive system provides ultra-quiet operation, while pre-programmed remotes allow for quicker installation. This DIY opener also includes GenieSense Monitoring and Diagnostic Technology for improved safety. This Chamberlain chain drive DIY garage door opener, available for purchase at Lowe’s, features a durable 1/2 HP motor and an industrial-strength chain drive for smooth, reliable operation. Homeowners have the ability to use MyQ Technology with this opener for added security. It also comes with a wireless keypad and two three-button remote controls. 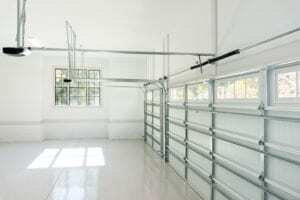 Keep in mind that after installing a garage door opener on your own, it’s important to have a garage door company come by to tune up the springs and cables and adjust them as needed to prevent the motor from burning out as quickly. Also, the tune-up helps ensure that your garage door opener is safely installed, which reduces the risk of accidents and injuries. If you need maintenance after installing a DIY garage door opener, we can help. Contact Action Garage Door Repair Specialists to get more information on our maintenance, repair and installation services. We also offer emergency services for urgent garage door repairs.